Arshak II – an Armenian Arshakuni king since 350. He built the town-fortress of Arshakavan and heroically protected the borders of Mets Hayq. 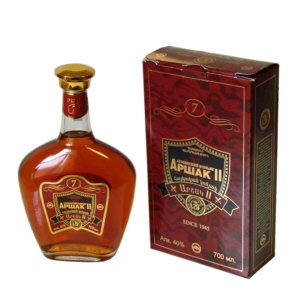 “Arshak” vintage brandy of 7 years is blended in oak casks from an ethyl alcohol with an ageing of 7 years, distilled from high-quality brandy raw product of the Ararat Valley best grape sorts.